You’re trying to be healthy. You’re loading your shopping cart full of delicious and nourishing vegetables. Hey, you’re even buying organic to avoid pesticides and other nasties. Good for you! There is clear evidence that increasing your consumption of fruits and vegetables is good for your health. But did you know that even your organic produce could be in major need of a proper wash? How many people have touched that produce before it made its way into your home? And while I personally am NOT a germ-a-phobe, when it comes to food that goes directly into my body (especially if it goes in raw!) then I want to be sure I’m not eating something potentially hazardous. Even organic produce, especially the kind that come from big factory farms, still generally use organic pesticides. Sure, I trust organic pesticides over man-made chemicals ones … but still, do I really want to be eating something like that? Not really. And why should I when the solution to clean vegetables is so simple? Plus, if you can’t afford organic, a good wash is an absolute MUST in my book. Wait… what secret ingredients? I thought an apple was an apple. But did you know that a lot of the produce available in grocery stores have a layer of wax on them? Wax was first applied to the skins of fruits and vegetables for longer shelf life hundreds of years ago. Today, that tradition is being carried on with a new generation of chemicals and compounds. Even organic produce seems to sometimes have this waxy coating on it, although it’s not clear what that coating may be. The good news is that my DIY vegetable wash (particularly the second one) can remove this questionable coating so that you are just eating delicious nature goodness. 4. Increase the shelf life of your produce! Properly washing and storing your fruits and veggies will help keep your produce fresher longer (I’ve especially noticed it with my #2 recipe below!) Winner winner. So go forth and wash! Depending on how dirty your produce is, use 3 parts water to 1 part vinegar (for example, 3 cups water and 1 cup vinegar) to soak your produce. 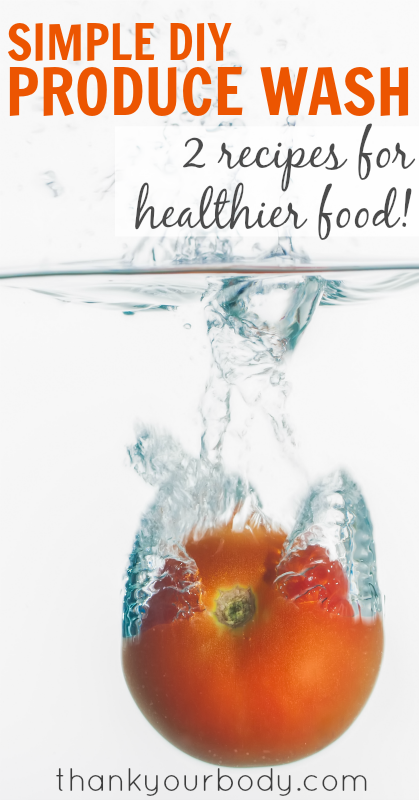 You can soak in your sink or a bowl, but make sure your produce is fully submerged. (You can also mix the water and vinegar in a spray bottle and spray it really good). The ratio of water to vinegar really varies depending on your source. If the idea of a vinegar wash doesn’t appeal to you, try reducing the vinegar… say 1 part vinegar to 5 parts water. 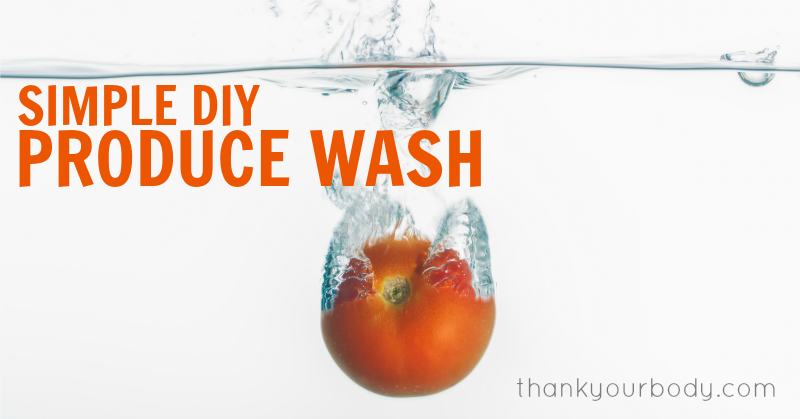 Soak your produce for 30 – 60 seconds and then give it a good rinse. You can rub while you rinse, too… if the fruit or vegetable is made for it. Submerge produce in filtered water (again, a bowl or your sink will work) and then add 2 – 3 drops of lemon essential oil. (My experience is with Young Living. It’s important to use a therapeutic grade oil since this will be contacting your food.) Stir the produce around with your hand to make sure it all comes in contact with the lemon. Let sit for a minute or two. Rinse. Note: It’s always a good idea to let your produce dry really well before storing. With berries I find that they have a longer shelf life (and don’t get moldy) if they are spread out during storage. There you go! Two simple ways to clean your produce and make your fruits and veggies last longer. I personally love the second recipe as there is no chance of a lingering vinegar smell… but both will do the job. Tell me… what’s your favorite way to clean your produce?